Esmont began as a community around 1840 on land acquired from Esmont Farm, and after the Civil War and depression that followed from 1870-1890, industry in the area started a growth cycle that brought jobs to the area. The discovery of soapstone in the area would see several quarries and a mill built. 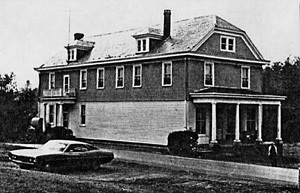 To support this growth in the area, a bank and several general and hardware stores opened either directly in the town of Esmont or nearby such as the Esmont National Bank, Henry L. Lane's Store, Pace's Store, and Steed's Store. In the late 1890's, the Hamlett Slate Company of Esmont and the Alberene Soapstone Mill wanted to shift from wagons to rail to transport their products to the world, and a new Nelson-Albemarle (N & A) railway line was constructed along Ballenger Creek's easy grade from Alberene through Esmont with Warren as its terminus. H. L. Lane served as general contractor for this spur off the N & A railway line, and the Esmont Depot was built just across the road from Lane's store in Esmont. Please click on each image below for a larger view and more information. Comments: Esmont Depot above was a train depot that originally was served by the Chesapeake and Ohio (C&O) Railroad. In the 1890's the C&O Railway had taken ownership of the Alberene Railroad. 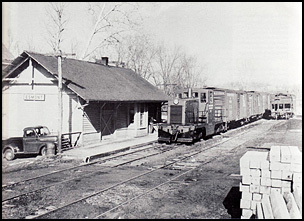 When the Nelson and Albemarle (N&A) Railway, a shortline serving local quarries and mines in Nelson and Albemarle counties, was formed by the Alberene Soapstone enterprises, C&O Railroad leased the portion of its railway between Alberene and Esmont to N&A. This N&A spur from Alberene and Esmont ended in the late 1930's due to the financial fortunes lost to many in the Great Depression. However, the entry of the U.S. into WWII brought back contracts to lower Albemarle and Nelson counties, and the N&A restarted business along the Esmont area and ordered their first deisel-powered locomotive (see above diesel locomotive) as diesel was much cleaner than the steam locomotives that had powered the rail line prior to WWII. To learn more, click on the depot photo at left above. 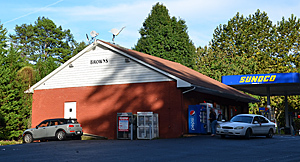 Comments: The current Brown's Market building at 7724 Irish Road in Esmont dates to about 1990 and is a Sunoco gas station and a convenience store. A business by the name of Brown's Market has occupied that site since at least the mid-1950's and was best known for its fried chicken while Mike Brown owned the store (motto: World's Greatest Chicken!). 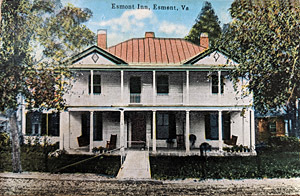 Comments: In the early 1900's, the Esmont Inn operated adjacent to C.C. Steed's store in Esmont village. This postcard was postmarked in Esmont and sent by Harriet Yancey to her daughter, May E. Yancey, in New Jersey to let May know that she had safely arrived back home in Esmont. Comments: The Esmont National Bank building was built in 1902 to house the bank as well as the offices of the builder, the Lane Construction Company. By the 1920's the building also housed the local post office which was located on the first floor on the right side as one entered the building. In the mid 1920's, Dr. Early occupied an office on the second floor of this building. During the Depression like many other small banks, Esmont National Bank went into involuntary liquidation/bankruptcy in April 1933. 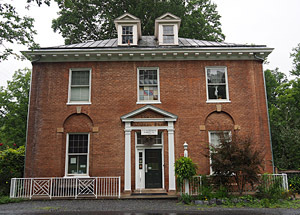 In 2018, this building continues to host the Esmont Post Office, which now occupies the two first-floor rooms on the left side of the building's main hall. 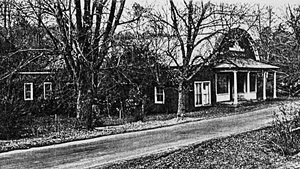 Comments: Henry L. Lane's store was one of the largest general merchandise stores in Albemarle County, and it was built immediately south of the Esmont National Bank in Esmont, Virginia. According to his papers, "Lane Brother's Commissary and Office Building was built in 1911." Lane closed his store in 1957, while it was being used as a drugstore. Later this building became the S.A. Payne General Merchandise Store before burning to the ground in the 1990's. Comments: Pace's Store was built in 1910 and is located at the intersection of Pace's Store Road and Esmont Road in Esmont. 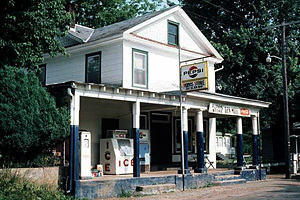 This business consisted of Pace's service station which sold candy, soft drinks, bread, and a few other household items. Next to the service station was a garage and in front of the service station were two gasoline pumps. In 2018 Pace's store is vacant. Comments: The Purvis Store is located at 7603 Esmont Road and is south of the Esmont National Bank Building. This large, two-storied building was primarily a grocery store and had a big front porch with ice and soda pop machines plus chairs where its customers could sit and visit. Former patrons of the store remember that in the late 1930's, the store was owned by Gilbert and Lucille (Purvis) Goff, and possessed one of the few telephones in Esmont. 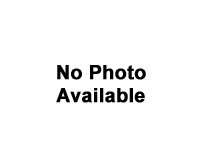 Lucille was the town 'fixer' who helped with many problems, and people wishing to contact a resident in the Esmont area would call the store and leave a message which Lucille would have delivered to the recipient. Later, the store had the only running water, indoor plumbing, and TV in the village. Comments: Steed's store, run by C.C. Steed, was a general merchandise store where customers could buy dry goods and household items as well as food for the family and feed for animals. This store building was built ca. 1910 and has an unusual half-moon shaped roof. Its big front porch overlooked the road that ran alongside the railroad tracks in Esmont. When it was constructed, Steed's store was one of five such general stores in Esmont and was adjacent to the Esmont Inn. 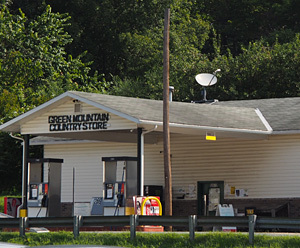 Comments: The Green Mountain Service Center was built in the early 1950's at 5977 Scottsville Road in Keene, Virginia, and its original owners were Oscar Mahone and his brother and sister-in-law, William and Ruth Mahone. The center opened on 2 April 1954, and it sold groceries, fresh meat,	fruits, and vegetables as well as Gulf gas and oil. It was famous for big hand-dipped ice cream cones. 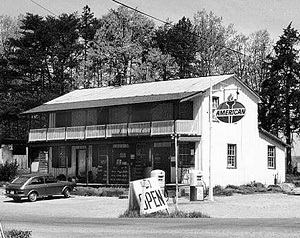 In 1979 the Mahone family retired and sold the Green Mountain Service Center. Its new owners renamed the center, the Green Mountain Country Store, and in 2018, the Green Mountain Country Store continues to support the local community with the same products as well as homemade delicatessan food and cold beer. Comments: Built in 1900, the Keene Store was a two-story balconied building at the corner of Scottsville Road (Rt. 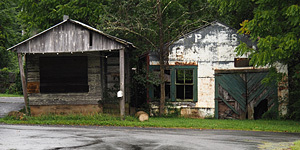 20) and Plank Road in Keene, Virginia. Keene Store sold groceries and had two American Oil gas pumps. By 1990, the interior of the store had burned, and the building was restored and adapted in 1994 into a veterinary clinic, named Piedmont Veterinary Service.